Spot, aka HL's Petey Mac, is a 2-year-old black and white male born April 24, 2009. His sire is EM's Mac Attack, and his dam is KL's Dixie. 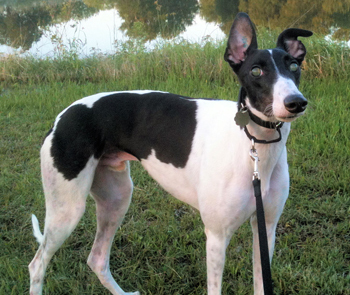 Spot's racing career never got off the ground so to speak, starting at Bluff's Run in Iowa and then moving to Gulf Greyhound Park in La Marque, TX. At the racing kennel in La Marque, Spot became ill with a fever and was not eating, but responded to medication. Several weeks later, just overnight, he appeared to be blind. Spot was transferred to GALT on March 30, 2011, and taken to VCA Preston Park Animal Hospital where he was under the care of Dr. Christy Soileau. All his bloodwork and tick tests are normal. Spot is acutely blind, and his ocular pressure is normal. Dr. Robert Munger of the Animal Ophthalmology Clinic has evaluated Spot's condition and has ruled out several diseases, including Toxoplasmosis, all parasites and also an Electroretinogram was performed showing his retinas to be normal. Spot was also referred to Dallas Imaging where he received a CT scan on Friday, May 20th. Results were clear and showed no obstructions or tumors. Based on the results of all, Spot's blindness is irreversible and was caused most likely by a central brain condition. Due to Spot's unique condition we would like to adopt him out close to our vets and his experienced foster parents to ease his transistion. 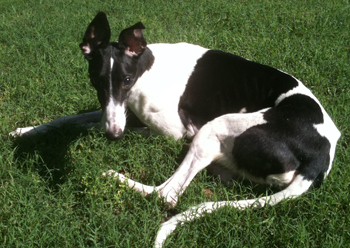 Spot is GALT's first blind greyhound; the internet has a wealth of information aiding us in Spot's care. Follow his saga on his Facebook page: GALT's Blind Spot! Spot has been returned to the Injured Reserve roster due to persistent nosebleeds. He will be evaluated with further tests at the Animal Diagnostic Clinic. Spot was seen by Dr. Kelly Nitsche of VCA Animal Diagnostic clinic on July 11 for further procedures. An echocardiogram was performed which Indicated there could be an infection in one of his heart valves. A test for Bartonella Vinsonii was also sent to North Carolina State University; those results are pending at this time. Dr Nitsche detected a heart murmur as well. The testing for Bartonella Vinsonni came back negative from North Carolina State University. Spot continues to have intermittiant nose bleeds - maybe nothing for 2 or 3 weeks and then drops of blood are discovered. His medical records are being shared with several premier veterinarians in the country specializing in greyhounds. Spot has a growth on the outside of his right hock. A cytology was done indicating it is a histiocytoma, which is benign. Because of the location of this mass, removal will be very difficult. These tumors usually regress on their own, which is what is hoped for. His foster family is closely monitoring this growth. Spot is also being treated for a bladder infection, and he is receiving two antibiotics to get it under control. No known nosebleeds have occurred in the last several months. Spot's tumor continued to grow at an alarming rate, so Dr. Christy Soileau of VCA Preston Park Animal Hospital removed it on Friday, November 4. Because of excessive bleeding from the removal site, Spot has stayed hospitalized over the weekend. The growth is being evaluated and results are pending at this time. Hopefully Spot will go back to his foster home on Monday. Spot's tumor was completely benign, so it is now just a matter of healing the area. He is being a really good boy and is not bothering the incision area at all. Stitches were removed, and the incision area is almost completely healed! It is the consensus of GALT's veterinarians and consulting vets that Spot is ready to find his forever home! His medical condition is stabilized with no nosebleeds or complications in quite some time.